This is the perfect dish for a light lunch, a first course or a brunch dish. The serving is just for one, but it’s so easy to make it for more. I'd probably go for two eggs and two polenta cakes if I was making it for a main dish or for a hearty eater. One of the wonderful things about this dish is that the runny yolk becomes some of the dressing for the salad. What I like about Davidson’s Safest Choice Eggs is that for people who are worried about not cooking an egg all the way through, they can enjoy a runny egg without worry due to Davidson’s pasteurization process of the eggs. The richness of the runny yolk, combined with the Aleppo pepper and lemon juice, makes for a wonderful balance of flavors over the greens. You can substitute another chile pepper for the Aleppo, but hey, I love the stuff. When combined with the smoked chile oil and pepper it’s a match made in heaven with the egg for chile heads. The polenta cake, crisped up with some Aleppo and parm makes for a perfect crispy and yet creamy side to round things out. Serves one, but easily multiplies. A ½-inch sliced round from a log of ready-made polenta. I get mine in the Italian section of the grocery. Of course you can make your own, but this is a time saver. Heat the oil over medium high heat in a small skillet. Dredge the polenta cake in the Aleppo and Parmesan cheese and season with salt and pepper to taste. Saute over medium heat, until the cake is golden brown on both sides. Reserve and keep warm in a 200°F degree oven until service. A splash of beer - maybe 1-2 Tablespoons - save the rest for a beer batter, a marinade or imbibe. Heat the same skillet you cooked the polenta in on medium-high with the butter. Once sizzling, add the egg and season with the Aleppo and salt and pepper. As the egg white begins to set around the edges, add the splash of beer and cover and reduce heat to low. Cook on low for one minute. Remove from heat and let it set for 1-2 minutes, until the yolk is still runny but warm. 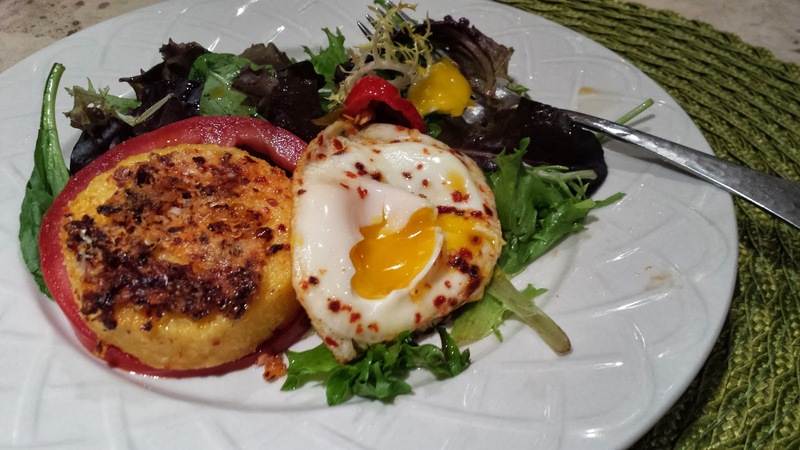 Plate the greens and polenta on the plate while the egg cooks. Easy - just toss the greens with the lemon juice and place on a plate. Throw the tomato slice on the side if you’d like. I went for a beautiful slice of tomato and placed the polenta cake on top of it. Next comes the beer-steamed egg and then the finishing touch of the smoked chile and the smoked chile oil. The beer can be substituted with water, but I really like the subtle flavor it brought to the egg. I think the addition of scallions or chive would really compliment the dish, particularly if you are leaving out the chile component. This would also be a wonderful dish served on a bed of sautéed spinach if you don’t happen to have fresh greens on hand. Enjoy!